My latest game with Stuart featured a scenario that has been a great favourite of his for many years, a French-Indian War scenario which rejoices in the title 'Leaping Indians', or more prosaically 'The Relief Of Fort Cumberland'. 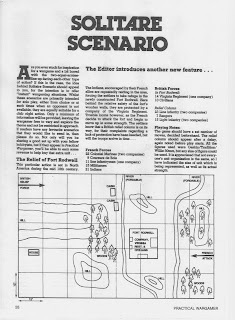 It featured in an issue of Practical Wargamer many years ago (Stuart doesn't remember the exact one), with the fort then called Fort Rodwell. I include the original article below with Stuart's permission. Clicking on the page should make it easier to read. 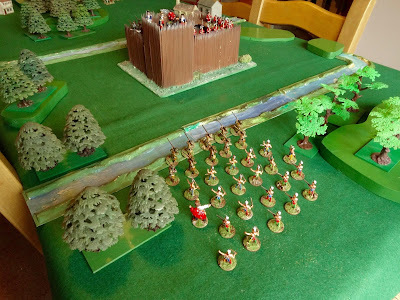 This scenario later formed the inspiration for scenario 27 'Raid On A Stockade' in the 1996 book Scenarios For All Ages, authored by Stuart and Charles S. Grant. 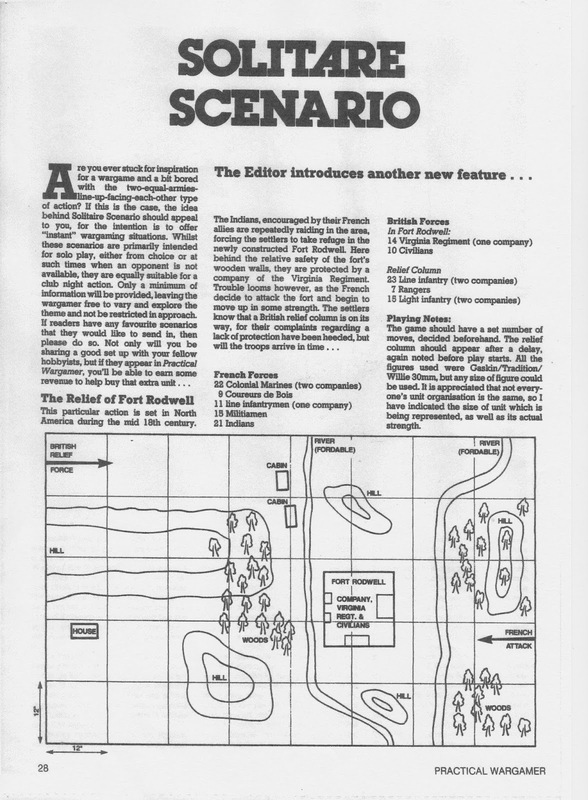 There were a few alterations for our own game to take account of the figures and terrain available, but the basic idea of the game remained identical. So without further ado I append Stuart's rules for this contest and the order of battle we used. Thanks to Stuart for writing these out and providing them for inclusion in the blog. (Note: Figures defending the fort are allowed a 6 inch move within the fort). Light infantry deployed into open order move as militia. All figures are individually based. Regular and provincial troops move at half speed if moving and firing. Militia and irregulars may make a full move and fire. Artillery takes a complete move to unlimber or limber up, and cannot move and fire. Musket short range: 0-3”, long range: 3-6”. Rifle short range: 0-6”, long range: 6-12”. Each figure firing rolls one dice. At short range a score of 5 or 6 removes one figure, at long range a 6 is needed. Any casualties have the right to return fire that game turn before they are removed. Each artillery piece rolls one dice (D6). Short range: 0-12”, long range: 12-24”. For counter battery fire, a 6 is needed at long or short range. Each hit kills a gunner, three hits and the gun is out of action until new gunners arrive. 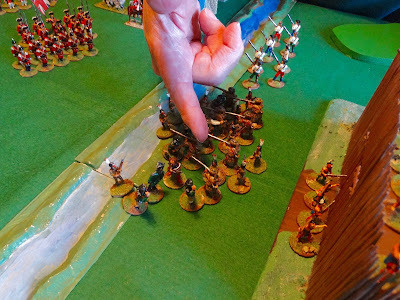 Two infantry figures (regulars or provincials only) may replace each of the first two gunner casualties, but there must always be at least one gunner serving the piece for it to fire. There are no penalties however, even if the gun is crewed by four non-specialists and one artilleryman. Roll one dice per base; highest score by one clear pip is the winner. Loser then falls back one move (normal speed) then rallies. Rallying lasts for one complete game move. Figures of coureurs de bois, rangers and Indians (only) are moved up into contact with the base of the fort’s wall. They may be fired at by the defenders. On the next move, one dice per figure in contact is rolled; a dice score of 6 is sufficient to permit the figure to scale the wall and land on the walkway behind it. If a defender is within half a move, a melee takes place at once, with the attacker being -1 for the first round (only). If there is no defender, the attacker’s figure may not move or fire for that turn, but may do so next turn without penalty (ie not melee at -1). 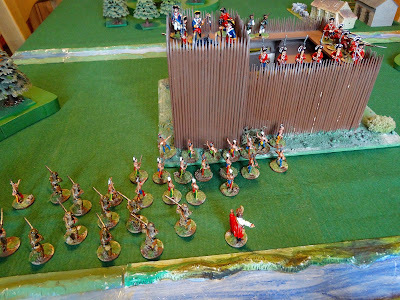 Apart from engaging in small arms fire, for regular and provincials to attack the fort, the gates must be opened from the inside of the fort. The original 8' x 5' table was condensed down to the usual 6' x 3' available in Stuart's dining room, but the essential features of the terrain were retained. One interesting feature of the rules should be emphasised - the move distance rolled had to be moved in full, unless terrain intervened. 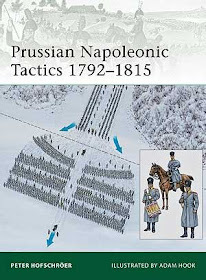 This created unfamiliar problems (at least to me) of units dashing off uncontrollably or lagging behind, and made force cohesion a real headache. A very simple but very entertaining idea! Most of the figures are from the Warrior AWI range, except the Indians which are Minifigs 'S' range. The river is made from Bellona stream sections of considerable pedigree, as gifted to Stuart by Charles S. Grant after use by his father. The buildings forming the farm are a Triang Lineside rubber cottage and a Skaledale barn. The house seen in the S.W. corner of the table in one or two photos is another vintage Charles Grant-made building as seen in the 1971 classic The War Game (complete with lift-off outer shell to reveal a ruined inner structure). The fort itself is home made. Looking from the French baseline, the Coureurs de Bois lead the 2 Indian groups onto the table. 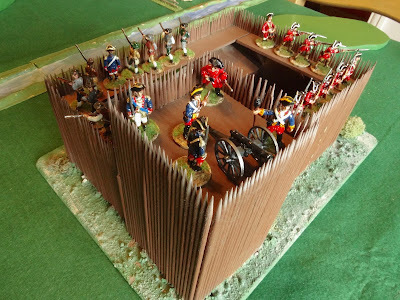 Fort Cumberland and its defenders. 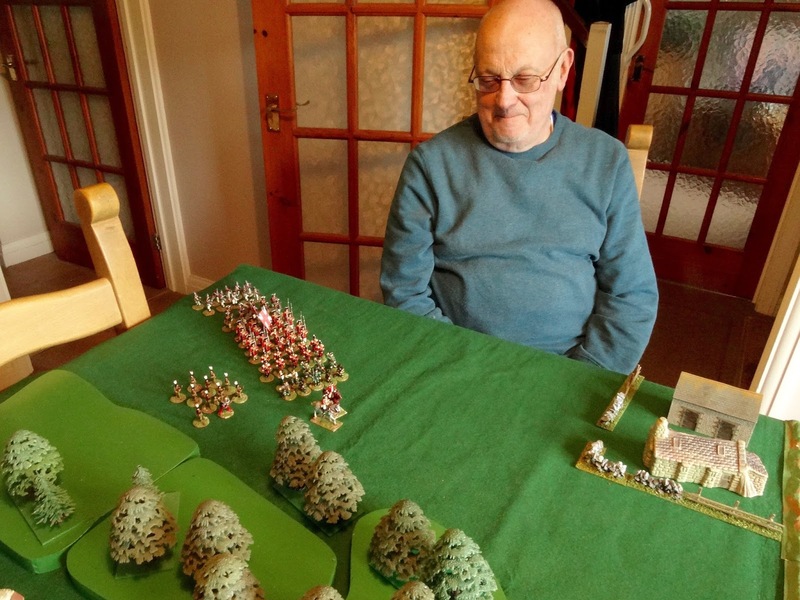 Stuart looks on with approval as his British relief column enters the table. Unfortunately, low dice rolling for movement slowed their approach to the fort. 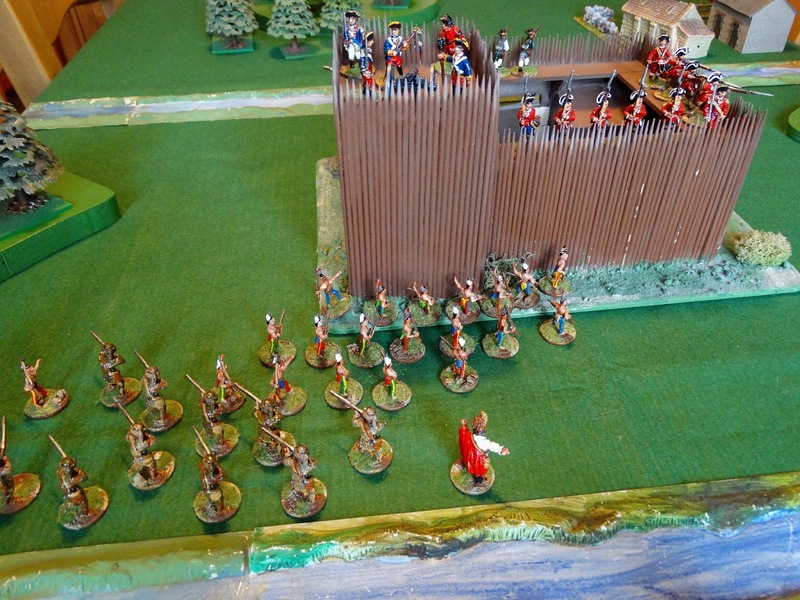 The French-allied Indians have rushed ahead in their desire for scalps and have reached the fort walls. British forces grind forward. 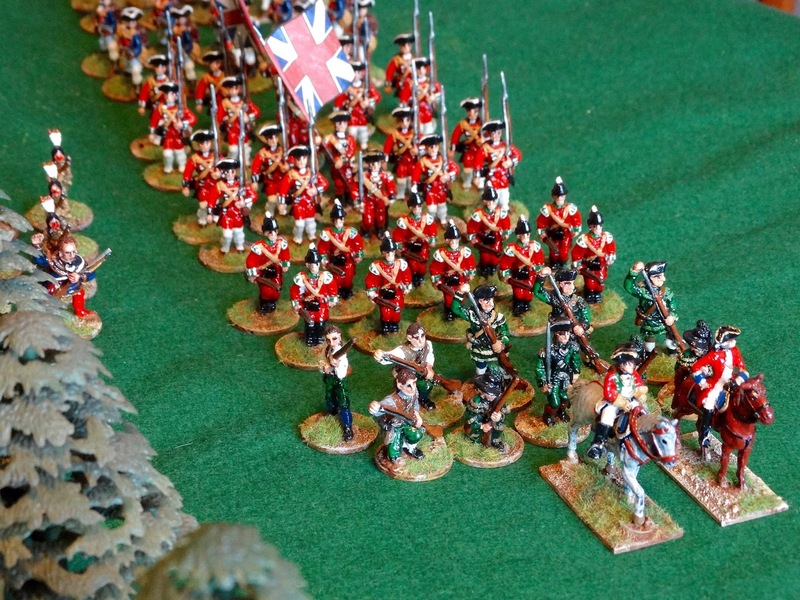 Roger's Rangers lead the way, with the light infantry behind. with the French regular companies coming onto the table behind them. The old Charles Grant house is seen at top left. 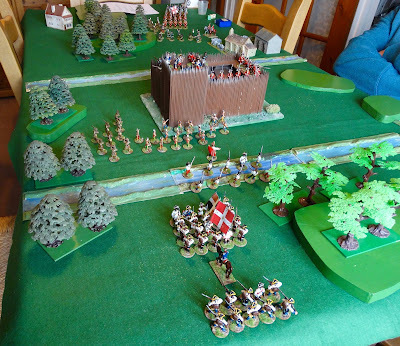 Roger's Rangers and the Mohawk Indians forge ahead of the slower British regular troops. 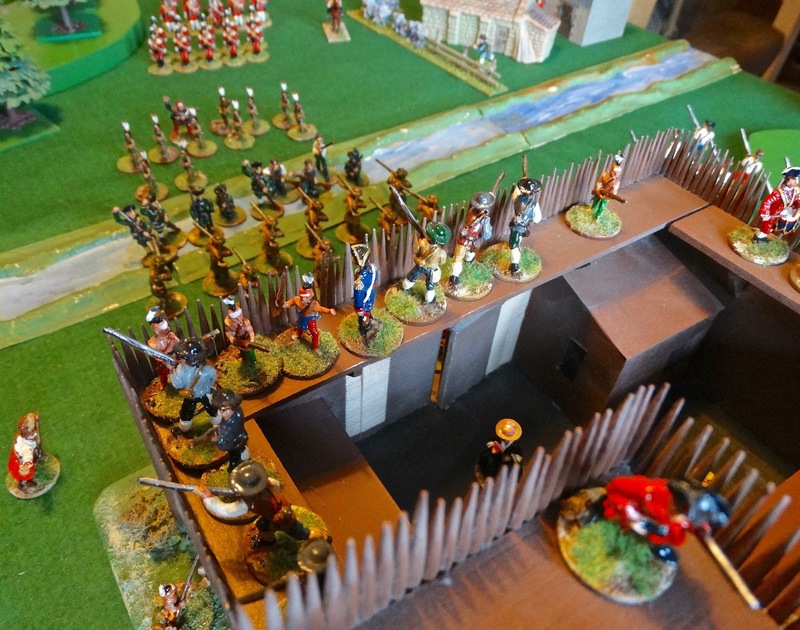 A number of Indians are on the battlements fighting desperate melees with the British defenders. 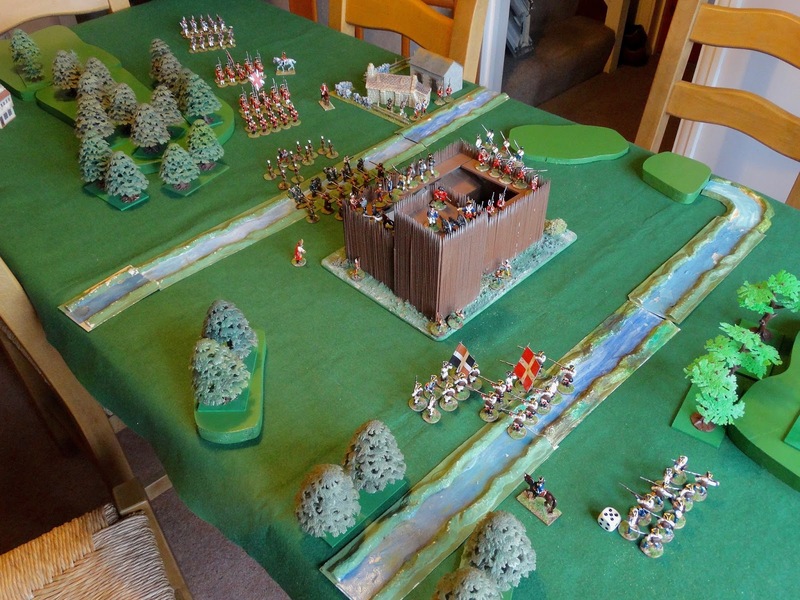 Beyond the fort the Coureurs attempt to block the advance of the British Rangers at the line of the second river. 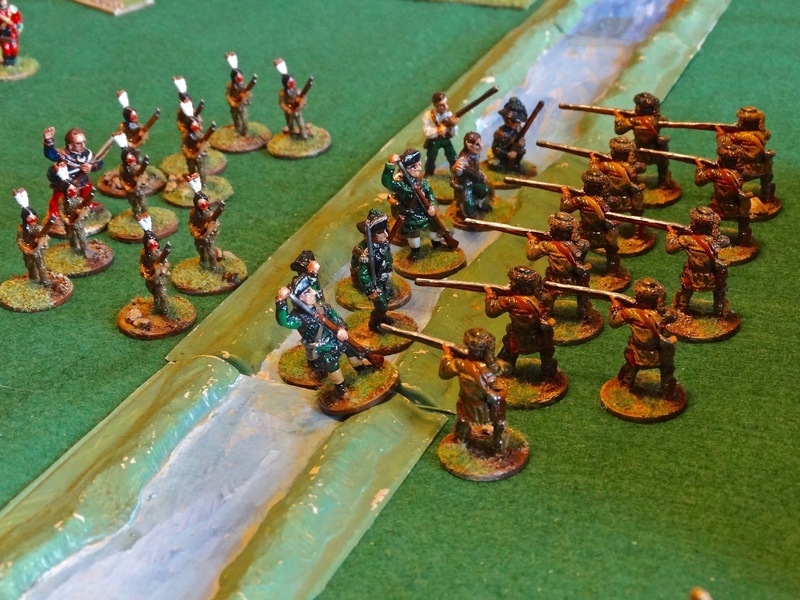 The Rangers are disadvantaged by fording the water in the face of the Coureur's musketry and suffer accordingly. Above the fort gate, 4 indians have made it onto the walkway. A number of the defenders have already fallen. 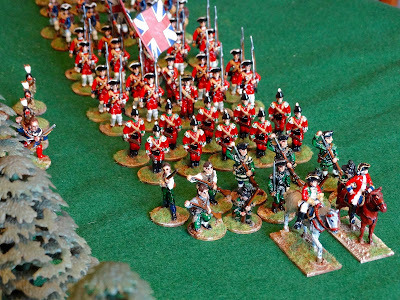 The French regulars had as much trouble advancing as their British counterparts. Here they struggle across the river east of the fort. 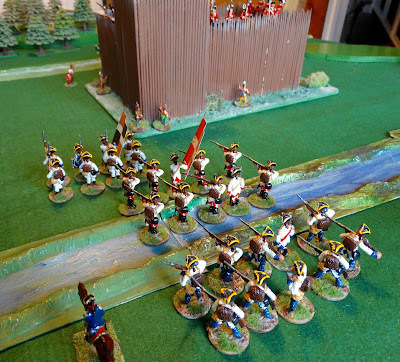 The Mohawks join the remaining Rangers and charge into the now outnumbered Coureurs. Most of the combats were 2 to 1 and the Frenchmen suffered heavily. When melees are fought as individual combats, it pays to have a thoroughly experienced pointer to ensure fair play. Stuart is one of the best, as demonstrated here. To the right can be seen a further group of Indians waiting to ascend into the fort. Sadly, we had to call an end to an excellent game while there was still all to play for. It was time for me to visit Lidl with my lady wife. Such are the pressures of modern living! Stuart's simple rules and excellent scenario had created an absorbing and enjoyable game, which had to end before either side really gained the ascendancy. I'm hoping we can re-visit this particular game in the future, but we are lining up a whole series of other games in the months to come. Stay in touch for more Old School action! 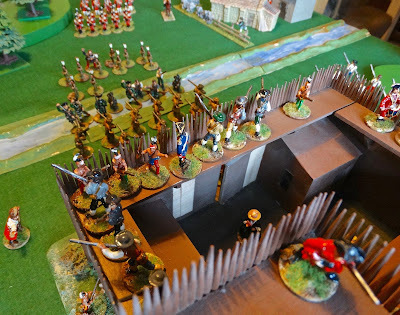 Splendid looking game and battle report. Thanks for sharing the rules with us too. Thanks for sharing this. I have vague memories of the original article, didn't the original pictures have Spencer Smith and other 30mm figures? Anyway, good stuff and something to remember when my semiflats hit the ground in Acadia. Excellent read, and fine use of the available space. Having limited space myself, I am always interested to see how others tackle that problem. You're quite right the original game did feature my Spencer Smith figures, but with the passing of many years they became brittle (haven't we all?) 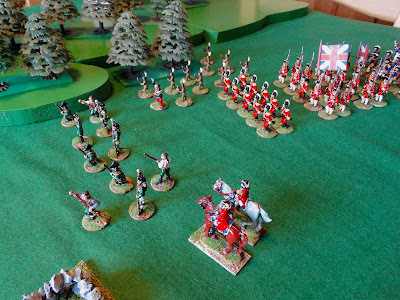 and I took the decision to replace them with the Warrior AWI range, along with some Indians from 'Old John'. 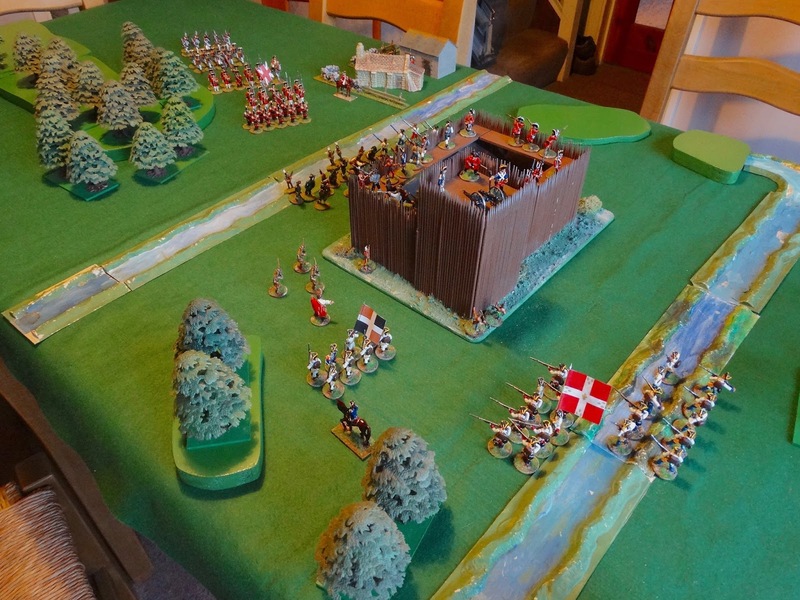 Great to see a scenario from Practical Wargamer on the tabletop again! I've got similar sized armies waiting for the paintbrush, so rather inspirational. Keith, I was wondering if you might be able to e-mail me at natholeon at hotmail dot com?